Three Days Workshop for Kendriya Vidyalayas (KV) Teachers (RESPECT KVs) (Oct 21-23, 2016). The workshop was conducted in collaboration with KVS, IAPT and Vijnana Bharati under supervision of Dr HC Verma. October 21-23, 2016 at OU Hyderabad. One Day Workshop on Optics for Physical Science Teachers. 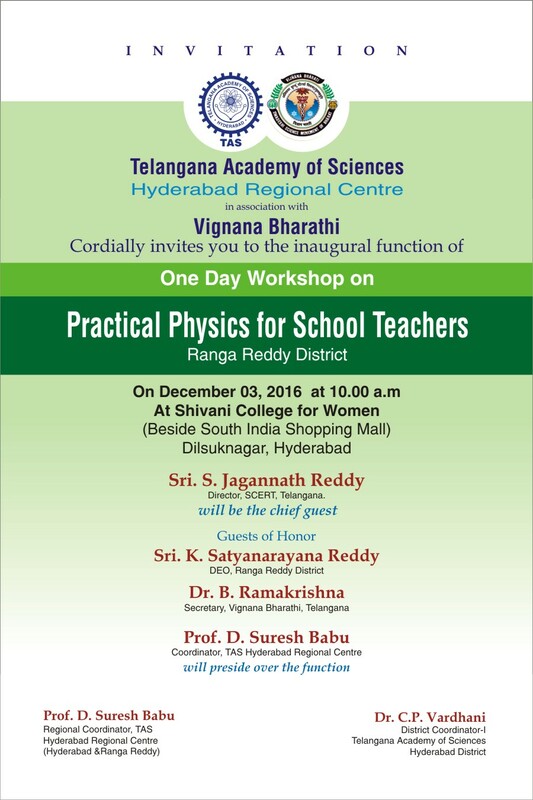 (Dec 03, 2016) The workshop was conducted in collaboration with Telangana Academy of Sciences. One Day Workshop on Optics for Physical Science Teachers (Nov 26, 2016). The workshop was conducted in collaboration with Telangana Academy of Sciences. ViBha Anveshika organises teachers workshop in Telangana state. These workshops are part of the Introductory Interaction Programme (IIP). We already conducted these workshops at Hyderabad, Nalgonda, Warangal, and Mahboobnagar. The ViBha Anveshika can accommodate 10 teachers (or students) at a time. The workshops are generally organised on Sundays or Public holidays. Please use the contact us form if you are interested to participate in these workshops. There is no fee for the workshop. We also conduct classroom sessions for students at school premises. The objective is to give a flavour of experiment based learning. These sessions can be of 45 min to 90 min duration. We also conduct science camps for students. These camps generally spans over two-three days.